211 (24 July 1944), 215, 222, 226, 235, 239, 246, 249, 261 (22 Oct 1944). Major John J. Casello (P) - 06 Sept 1942 -Graduated from cadets as a 2Lt Pilot 03 May 1943 - Assigned 360th. 16 Aug 1943 - 360th BS Operations Officer. 10 July to 17 Sept 1944 - 360th BS Commanding Officer (Period when LtCol Shayler was in the USA on leave). 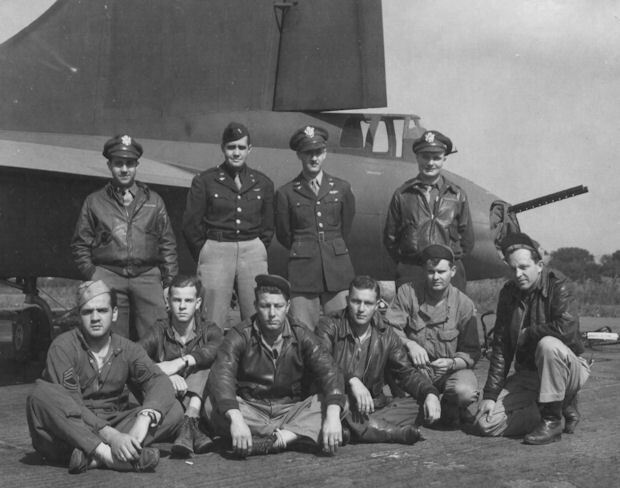 17 Sept 1944 - Renamed 360th BS Operations Officer. 04 Nov 1944 - Transfer to 379th BG(H) at Kimbolton as Group Operations Officer when Col Lewis E. Lyle became 379th BG(H) Commanding Officer. 4 May 1945 - Commanding Officer 524th BS/379th BG(H). Promotions: Captain - 20 Aug 1943; Major - 29 March 1944. 1Lt Wesley V. Huguenin (CP) - Flew on 16 credited missions with Capt Casello - (As CoPilot -38, 40, 41(A), 42, 43, 45, 47(AS), 48(A), 50, 51(AS), 52, 53, 55, 56, 57, 63. As Lead crew Tail Gunner/Observer - 92 & 98. Nine missions with other Pilots: As Co Pilot (50, 64 & 119); As Lead Crew Tail Gunner/Observer (79, 89, 100, 104, 115, 119). 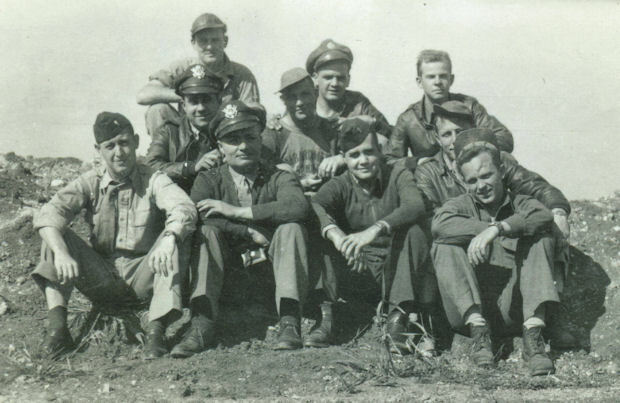 25 mission combat tour completed on 8 March 1944. Capt Lawrence E, Effinger (N) - Flew on 16 credited missions with Capt Casello (37, 38, 40, 41(A), 42, 43, 45, 47(AS), 48(A), 49, 51(AS), 57, 66, 68, 71, 75 ,92, 98). Nine missions with other Pilots (50, 58, 59, 60, 63, 64, 67, 79, 83). Promoted to Captain as a Lead Crew Navigator. 25 mission combat tour completed on 11 Jan 1944. Capt Jack B. Fawcett (B) - Flew on 16 credited missions with Capt Casello (37, 38, 40, 41(A), 42, 43, 45, 47(AS), 48(A), 49, 51(AS), 52, 53, 56, 57, 63, 75, 92). Eleven missions with other Pilots (50, 58, 60, 64, 67, 69, 82, 94, 106, 110, 113, 120). Promoted to Captain as a Lead Crew Bombardier. 25 mission combat tour completed on 31 Dec 1943.